The hot fill bottling machine is our level filler designed and tested to fill liquids at temperatures up to 90 °C (194 °F). The level fill unit is designed with a sensor probe that shuts off the fill at the desired height. Simply adjust the shelf to the desired height, then place the bottle on the shelf, to set the fill level wanted. The flow is triggered by resting a bottle on the snap switch. The fill will shut off when the sensor detects the liquid hitting the correct level in the bottle. Perfect for use with hand-blown and other specialty bottles that have slight variations in bottle wall thicknesses, punt size, diameter of the bottle, and neck height, among other inconsistencies. The Level Fill model is for use with juices, isotonic beverages and other liquid food products requiring exposure to high temperatures prior to bottling. This unit may not be suitable for liquids with high particulate content - please provide samples for testing. 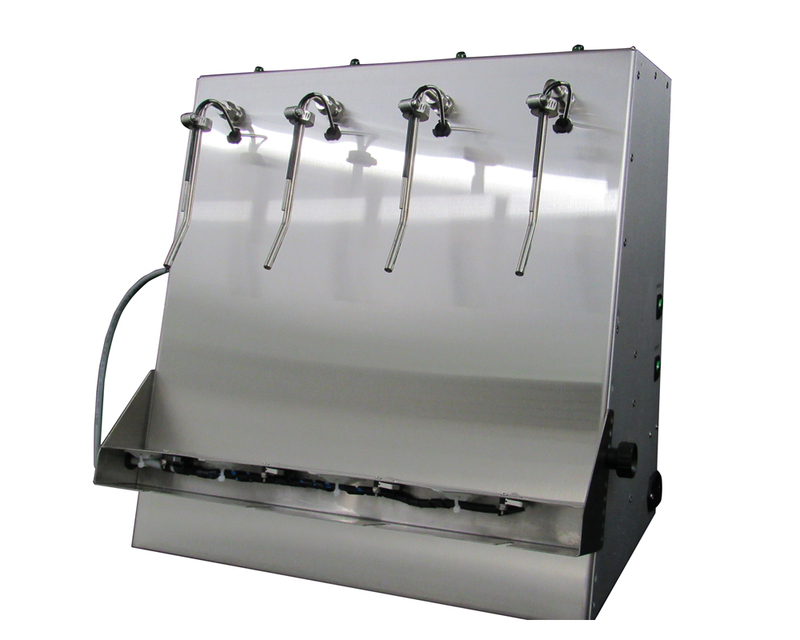 The level fill machine is designed around a cylindrical 750mL wine bottle. Cleaning takes less than 8 minutes, making it easy to change liquids.